A couple of months ago I finally decided it might be convenient to have a portable Bluetooth speaker that I could use to play music from my phone or other device. The idea was that it would be something I could use when we’re playing a card game or outside grilling. After scrolling through numerous reviews on Amazon I encountered this little device, which I eventually received as a gift from my wish list. 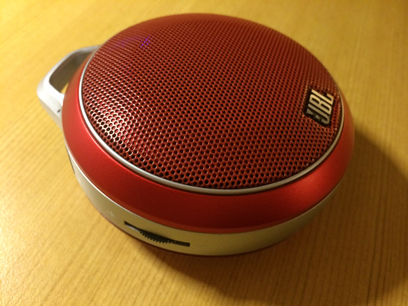 The JBL Micro Wireless Ultra-Portable Speaker provides amazing sound considering its size. According to the documentation it will run on battery for about five hours, though some reviewers have experienced longer usage times. It’s also possible to use the device while recharging it. Considering its size and relatively low cost (about $50), I am very impressed by this piece of tech. So was my wife. The first time I tried it out she immediately stated that she wants one. Friends have made similar comments when showing it to them. 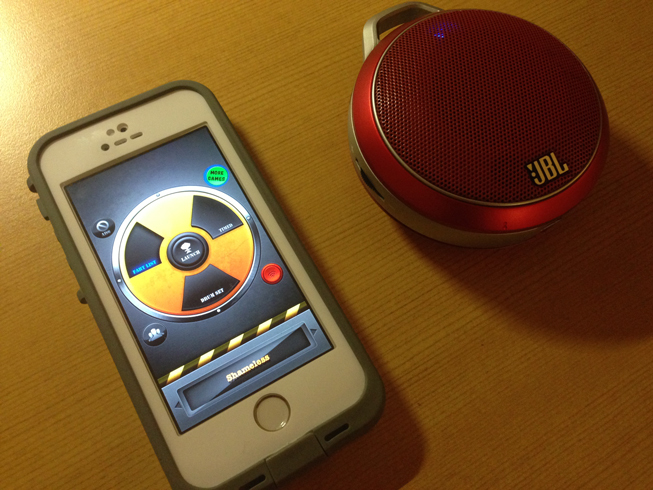 There are other very similar JBL models. This particular one has a built-in bass port. It’s been useful in cases when I didn’t expect it. For example, the turn-by-turn navigation instructions from Google Maps sounded excellent. The Monoprice battery has worked very well since I purchased it but I wanted to have a battery with a greater capacity (and it doesn’t hurt to have an additional battery as well). I always have my iPhone with me and I often carry a mifi and the 3DS as well. In addition, sometimes I’m traveling with others that have a device that could use a recharge. Last March I purchased an Anker Astro3E 10000mAh External Battery. 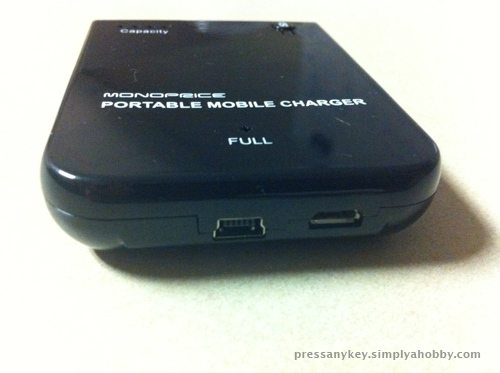 Functionality of the device is similar to the Monoprice battery so I won’t bother with describing the minor details. Overall, it’s similar but clearly does provide greater battery capacity. It’s been used several times and I haven’t had a problem with the device itself. I have noticed an odd issue with my portable Powermat charging mat – when the battery is fully charged (or nearly fully charged) the mat will turn the charging on and off repeatedly, which can be very annoying if the charging sound on the mat is enabled and it happens in the middle of the night. However, this isn’t an issue with the battery and I’ve experienced a few oddities with the portable charging mat and other devices. Updated 05/22/2013: I’ve been using this battery for a while and so far it has worked great. I’ve had the opportunity to use it on several trips and I’m actually using this battery more than I am the Monoprice battery. 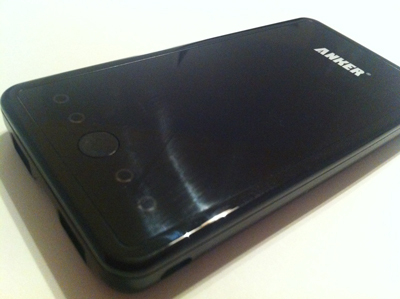 Updated 07/06/2014: This battery still works great and is extremely useful when traveling. I recently purchased a portable backup battery made by Powermat. I’ve been very happy with the Powermat charging system so I figured I’d purchase a Powermat-compatible battery that my wife might use with her new iPhone. I’ve given up on trying to find a durable iPhone battery pack. The Monoprice case didn’t work out (not a surprise) nor did the mophie Juice Pack (this was a surprise). However, I still have a need to conveniently recharge my phone away from an electrical outlet, especially while traveling. This time I chose a solution that I thought would be more elegant in its utility. 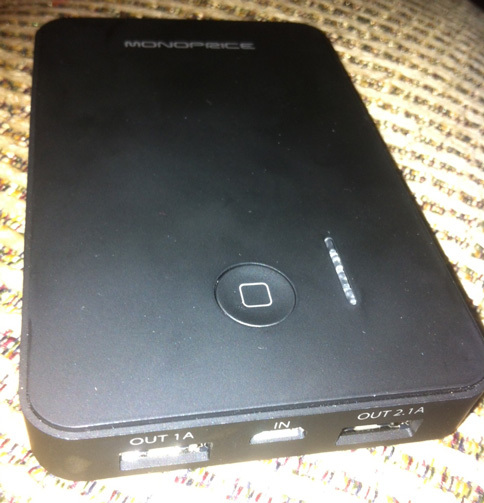 Late last week I purchased a Monoprice 5000mAh External Battery Pack. It includes two USB charging ports (one for 1 Amp devices and another for those that need 2.1 Amp) for output and can be recharged via a micro-USB port. The cost was reasonable at just under $30. Now, I haven’t had any problems with the inexpensive cables I’ve purchased from Monoprice. However, the devices are often hit-and-miss. So far, this one seems to be a winner but having owned this item for less than a week isn’t enough time to really know yet. 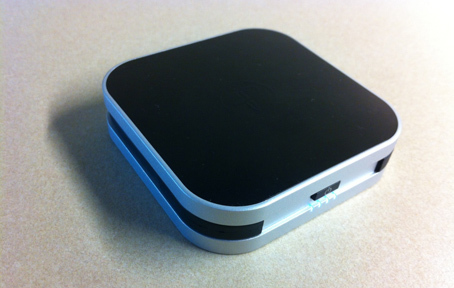 The elegance of this package is that I can use it with almost any small device that can be charged via USB. Combined with a few UPS backups, a CPAP battery, and a solar battery at home I now have one more emergency power source in the event that I ever need it. It also fits easily into my laptop bag. It’s not tiny. It’s larger than the iPhone but it does fit into a pocket well enough that one can connect the charging cable from the iPhone to the battery back and carry it around. I’ve used it several times this week to keep my phone charged at times when I was using the phone more frequently than usual. Updated 11/17/2012: This continues to be a good solution for charging my iPhone without having to use a wall charger or when one isn’t available. I’ve used it several times to charge other devices including a couple of different Android devices, my wife’s Sharp FX, and a mifi device. A couple of months ago my wife changed phones and ended up with a Sharp FX. While shopping on Monoprice this week I decided to get her a backup battery that she could carry in her purse just in case she needed to charge her phone while out. She wasn’t having problems with the phone’s battery life, but I figured I’d get it and then she could decide if she’d use it (if she didn’t want it I’m sure I could have found other uses for it). 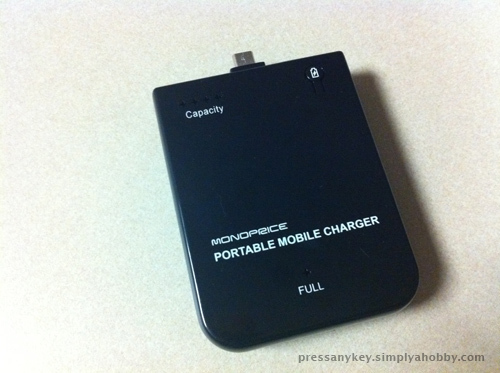 I purchased a Monoprice Micro USB Backup Battery Pack for Smart Phones, Cell Phones and Cameras (2800mAh) for $13.28. Just as with the flexible keyboard, if it turns out to be a piece of junk, well, we didn’t spend much on it but perhaps it will outperform its cost. Since we just started using it tonight I can’t state whether or not it’s any good but it is connected to her phone and appears to be charging it. The actual capacity and battery life are things that will only be demonstrated over time, so if I learn anything new I’ll add it to this post as an update. 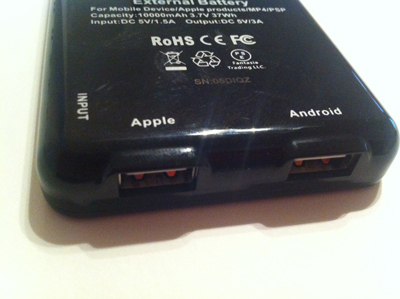 Updated 09/14/2011: My wife has used the battery to charge her phone on at least two occasions. It seems to be working as expected. I’m one of those unfortunate souls cursed with a bad case of sleep apnea. For several years I’ve been sleeping with a mask over my face to make sure my airways stay open at night. My first CPAP machine was a Resmed S8 Compact. It worked well but I often had bad nights once in a while and last year I was finding that it just wasn’t working well for me. There’s nothing wrong with the hardware and I still keep it as a backup. My sleep significantly improved when I bought a new Resmed S8 AutoSet II last year. It’s capable of automatically adjusting my pressure within a certain range. I’ve been very happy with that model since I got it. However, just as glasses help with vision but are a problem when swimming, so is a CPAP a problem when camping or otherwise without power. We’re planning a trip for later this year when I may be away from power for several days at a time so I started looking at a solution. At first, I looked at various sealed chargers/car starters that are basically car batteries in fancy packaging. Overall, other CPAP users’ comments weren’t promising and the cost seemed high relative to the usefulness. Finally, I stumbled upon CPAP.com‘s battery backs made specifically for CPAPs. Specifically, I found the Respironics Battery Kit for S8 Machines, which includes the battery pack and the necessary DC adapter for my machine. I checked with a company that manages one of my health benefits and they replied that it was covered as an eligible expense (the check is actually in the mail now). I ordered this product and it arrived quickly. Just to make sure it worked I charged it up and used it for two nights without a problem. It would have probably lasted longer but I didn’t want to run out of juice in the middle of the night and not realize it when I did have AC power. It’s not light (17lbs) but it weighs less than most battery packs for this type of use and it’s not a problem to carry around unless one plans to hike into a campsite. Overall, I’m very satisfied with this product. Note that with this battery pack, and most others, you can’t use the humidifier with the CPAP. It draws too much power. How much use you can get with a battery pack depends on how much pressure you need. Updated 08/13/2011: So far the battery has held up well and worked exactly as expected. It had one good test while on a trip out in the west Texas desert. It provided power for the CPAP for two full nights while camping. I’ve also used it on a few overnight trips when a power receptacle wasn’t in a convenient location. I keep it near the CPAP at home and about once a month I top off the charge, run it for two nights, and then recharge the battery again. I do this to help maintain the battery life and to keep it ready in case we have an unexpected power outage. 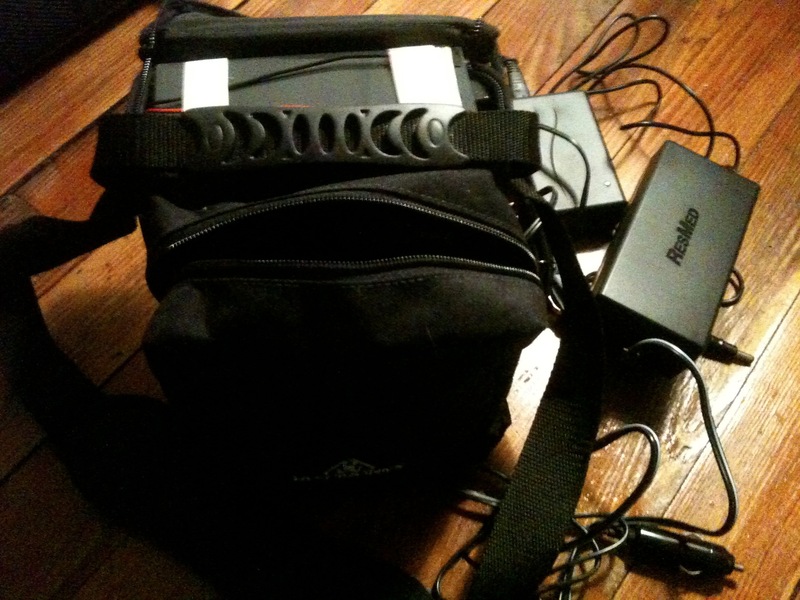 Updated 03/31/2012: While preparing for a long road trip I decided to bring my CPAP battery along but not to power a CPAP. Instead I’m using it to power various small electronic devices (iPhone, Nintendo 3DS, electronic cigarette charger) and it worked just fine using the standard car adapters for those items. This is an added bonus considering the cost of the battery. It also gives me an additional use for the battery. It might also serve as a good backup plan for charging my phone in the event that we lose power at home.